Two children begin a restrained friendship, conducted on the steps outside their block of flats and on long walks through their bleak, urban environment. Caps are often pulled down over faces and a great deal said without being spoken out loud. 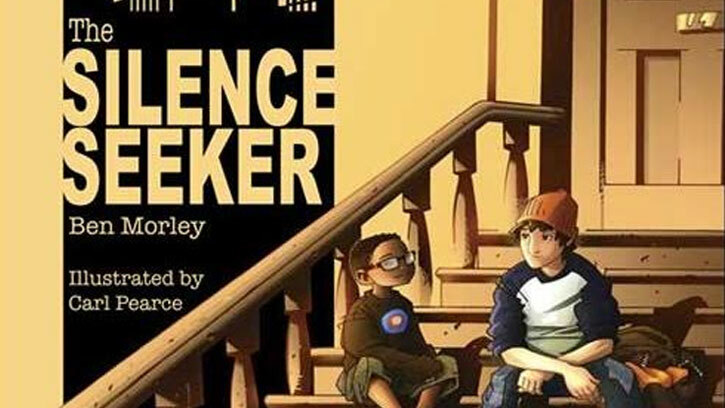 The whole story hinges on the child-narrator’s apparently naive mistake in hearing ‘asylum seeker’ as ‘silence seeker’. This ‘mistake’ reveals how a child’s misunderstanding is so often not so much a lesser understanding as a new perspective on an old problem: the child-narrator has an empathic realisation that his Silence-Seeker friend, who has run from violence, war, trouble of many kinds, must now very much need quiet (along with peace, safety). There’s a wistful quality to the child-narrator’s voice here, a sense of a felt gap in understanding between the two friends: experience which just can’t be shared. This seems mature but the child-narrator’s voice somehow never feels less than realistic, his longing to make a connection with the other child is touchingly drawn. There are many kinds of silence in ‘The Silence Seekers’: there’s the nuance in the pauses, the things left unsaid; there are the gaps in the narrator-child’s understanding; the palpable sense of the refugee child’s unwillingness or inability to name his troubles, and the silence of his resignation – no one will understand; lastly, the silence as our child-narrator listens so respectfully. Perfectly attuned to all that a silence seeker just can’t say. There’s a quality of stillness to this story that becomes gently haunting. And the book has a subtlety which lets it speak to adults as well as to children (the twist-in-the-tale on the last page makes you softly catch your breath). A book that feels essential, every school library ought to have a few well-thumbed copies, I reckon.